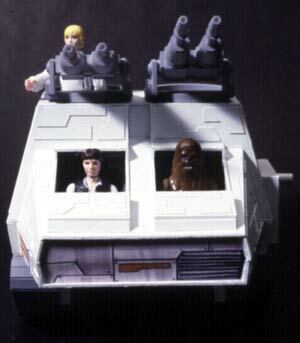 Very few vehicle concepts are known to have been considered by Kenner and not released. There is the White Witch from the Droids line, of course, and the infamous Blockade Runner toy that was considered for the Return of the Jedi line. But up until now we haven't known of much beyond that. 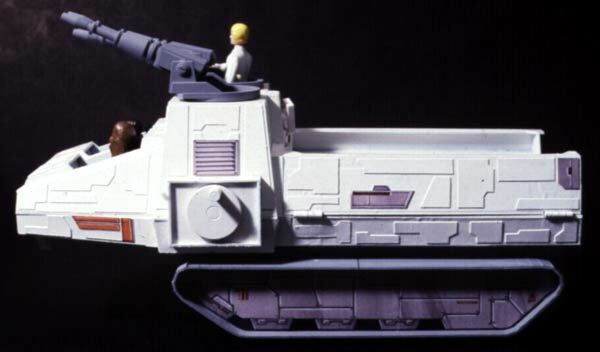 What you see here appears to be a toy that was conceived as a vehicle the Rebels could use while hiding on the snow planet of Hoth. 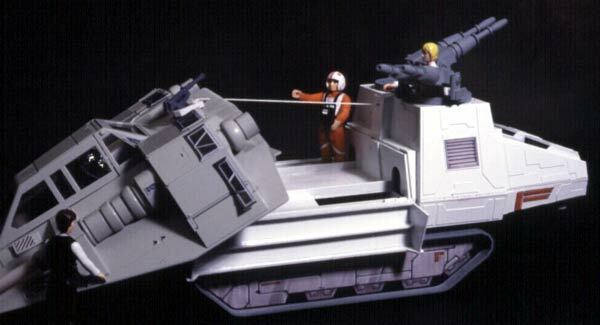 This is evident from the tank-like treads mounted on it, as well as its being paired with a snowspeeder toy. 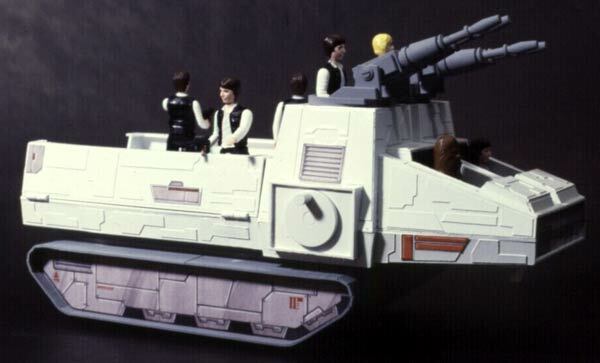 It's important to realize that this is not an injection-molded piece; it was entirely mocked-up by a model-maker using styrene and similar materials (including, quite possibly, parts from other Kenner toys). In this side view, one can see that the treads are non-operable. Instead, they're simple plastic pieces with cardboard inserted into their depressions in order to simulate mechanical details. Also notice the crank mechanism located below the gun mount. It reminds me somewhat of the crank depicted on the early design AT-AT drawing. A view from above. Apparently, the Rebels cloned Han Solo several times over. 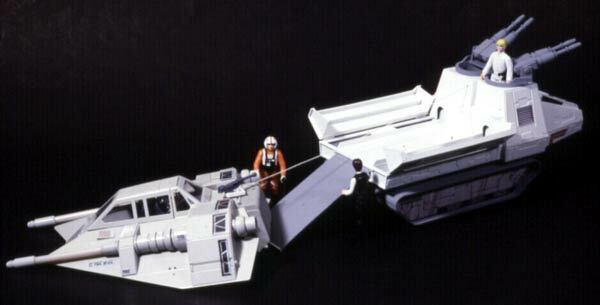 The following three photos served to demonstrate one of the action features of the toy-- a tow truck-like crank, which could be used to tow disabled snowspeeders and the like. A closer view. 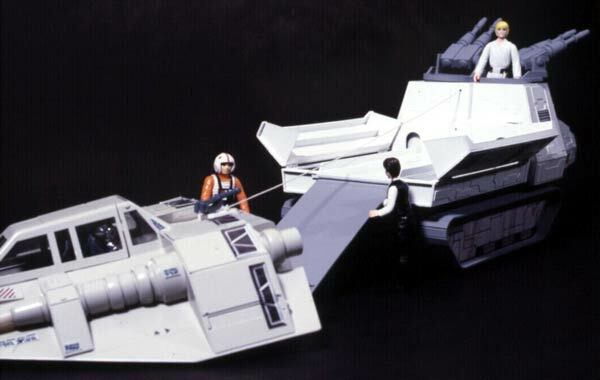 Note the snowspeeder toy-- it, like the unproduced vehicle, is a hand-made mock-up. 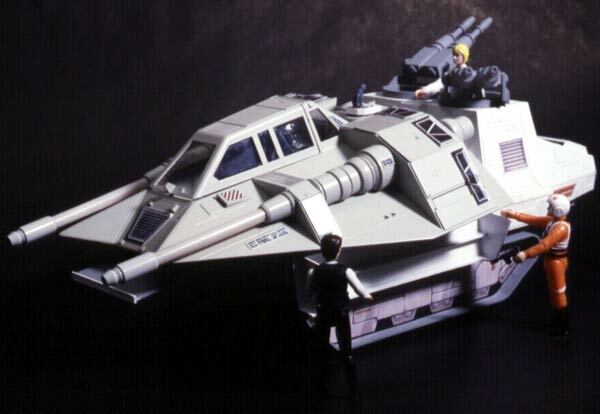 It actually is probably the same snowspeeder prototype that is pictured here. The guns are the only details on the two prototypes that don't match up fairly closely. And the job is complete! I bet you never thought of Luke as the Star Wars equivalent of a tow truck driver. I've never seen any other material relating to this unproduced toy. While it's hard to say how far along in the developmental process it got before being axed, I sincerely doubt it got too far. 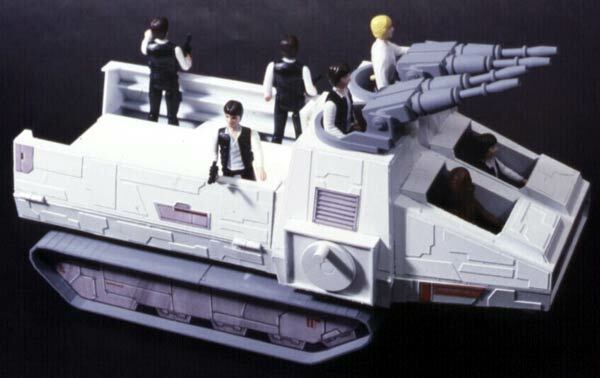 Judging by the early nature of the snowspeeder prototype and the figures included in the photos (all of which date from before 1980), I'd say it's likely that this was intended for release with Kenner's debut range of Empire Strikes Back product in mid-1980. It's definitely a pretty cool item. But, in my opinion, it doesn't look too Star Warsish. However, looking at it that way, I suppose it can be considered a sort of pre-cursor of the mini-rig vehicles that debuted a couple of years later. Unfortunately, this item is not known to currently be in existence. The image comes from a batch of slides unearthed by Chris Fawcett, web master of 12back.com.